The objective of this tutorial is to exemplify the execution of MATLAB - a high-level language and interactive environment for numerical computation, visualization and programming, on top of the UL HPC platform. For the tutorial we will use the UL HPC Gaia cluster that includes nodes with GPU accelerators. on Windows you will need to run VcXsrv first then to configure Putty (Connection -> SSH -> X11 -> Enable X11 forwarding) before logging in to the clusters. After a delay, the full Matlab interface will be displayed on your machine and you will be able to run commands, load and edit scripts and generate plots. An alternative to the graphical interface is the command-line (text-mode) interface, which is enabled through specific parameters, described in the following section. In this command line you are now able to run Matlab commands, load and edit scripts, but cannot display plots - they can however be generated and exported to file, which you will need to transfer to your own machine for visualisation. While the text mode interface is spartan, you still benefit from tab-completion (type the first few letters of a command then press TAB twice to see possible completions) and can run the integrated help with help command_name (e.g. help plot3). Note: If the Google Finance API is not available, you can use the file_data_source.m function with the AAPL ticker to use pre-downloaded data. 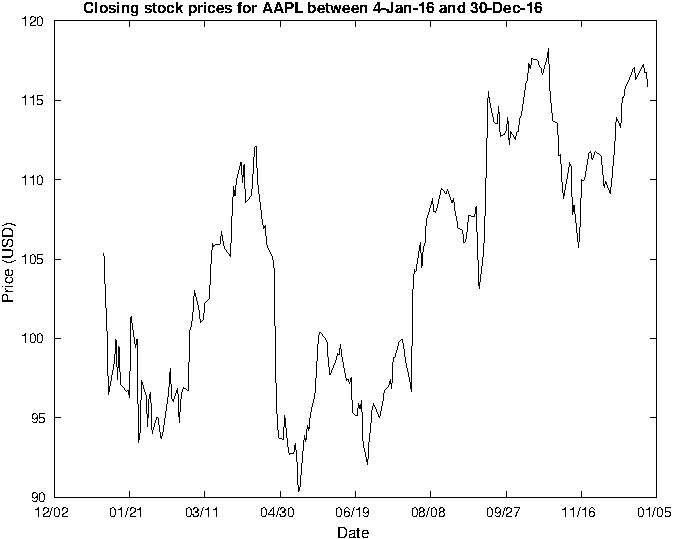 Through these commands we have seen that the function returns column vectors, we were able to get 24 days' worth of information and we used simple statistic functions to get an idea of how the stock varied in the given period. Elapsed time is 1.709865 seconds. Note: You'll need to edit example1.m to use the offline data source file_data_source.m in place of the Google Finance API, if running example1 shows an error. 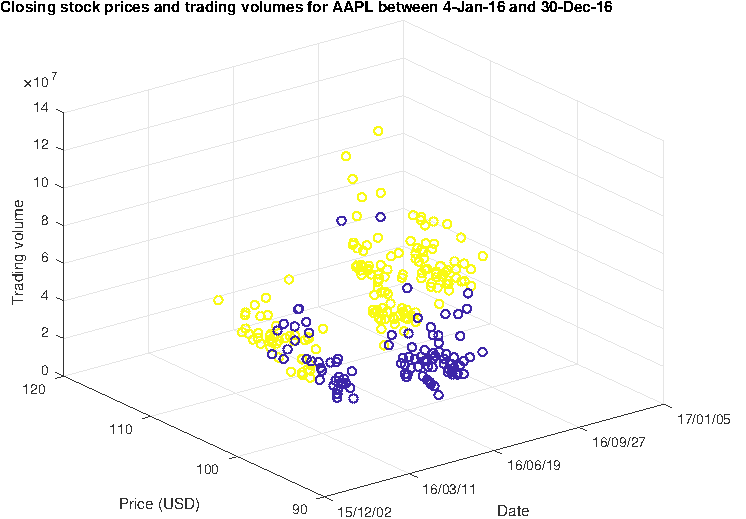 The script has also used the tic/toc Matlab commands to time it's execution and we can see it took less than 2 seconds to download and process data from the Google Finance API and generate the plots. Finally, we have closed our Matlab session and were returned to the cluster's command line prompt where we found the generated plots. Further examples showing serial and parallel executions are given below in the 'Example usage of Matlab in passive mode' section. In order to be able to run MATLAB and specific features provided through the various MATLAB toolboxes, sufficient licenses need to be available. The state of the licenses can be checked with the lmstat utility. The second usage mode is recommended as it corresponds to the batch-mode execution. In the first case your output file will contain the '>>' characters generated by Matlab as if ran interactively, along with the results of your own commands. However as the second usage mode runs your script as a command, it must contain the quit command at the end in order to close Matlab, otherwise after the script has executed Matlab will stay open, waiting for further input until the end of the walltime you set for the passive job, tying up compute resources needlessly. (gaia-frontend)$> oarsub -l walltime=24:00:00 "source /etc/profile; module load base/MATLAB; matlab -nodisplay -nosplash < INPUTFILE.m > OUTPUTFILE.out"
Remember! that the Matlab script you run with the '-r' parameter must contain the quit command at the end in order to close Matlab properly when the script finishes. -- Execution time with overhead: 51.693702s. -- Execution time with overhead: 21.025083s. -- Execution time with overhead: 19.772026s. -- GPU-Parallel test not available on this system. The next launcher script is also able to read an environment variable MATLABMP and create as many parallel threads as specified in this variable. We will now generate another launcher which will set this variable to the number of cores we specified to OAR. -- Found environment variable MATLABMP=6. We have submitted an OAR job requesting 6 cores for 5 minutes and used the second launcher. It can be seen that the example2.m script has read the MATLABMP environment variable and has used in its execution. Take a look at the MATLAB code to see how this is accomplished. As shown previously, the jobs we have submitted did not run on GPU-enabled nodes, thus in this last example we will specifically target GPU nodes and see that the last test of example2.m will also be executed. Before testing the following commands, edit the matlab-minlauncher2.sh script and make MATLAB store its output in a example2c.out file. -- GPU Execution time: 19.809493s. -- GPU Execution time with overhead: 21.399610s. -- GPU vs Serial speedup: 1.249748. -- GPU with overhead vs Serial speedup: 1.156884. Relative to the fast execution of the inner instruction (which calculates the eigenvalues of a matrix) the overhead given by the creation of the parallel pool and the task assignations is quite high in this example, where for 12 cores the speedup is 5.26x but taking the overhead into account it is only 4x.